Last week on Did You Know Tuesday, I featured John Wayne. This week, he appears again, but in a different way. At least most of his characters do. 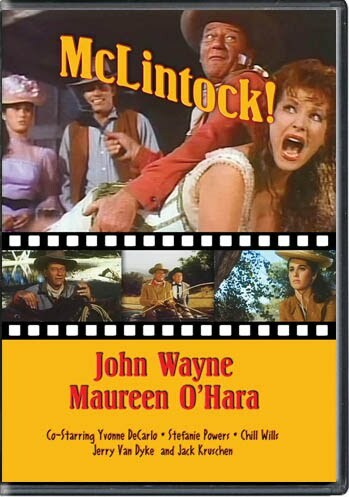 My favorite John Wayne is McLintock! Shouldn't the fact that the movie's title has an exclamation point in it tell you something? But there were a lot of things about this movie, and the star behind it, that I didn't know. Did you know that while making this movie, production shut down for a week due to the assignation of President Kennedy? Or that the famous "mudhole" scene that took place in the movie was not actually made of mud? In fact, it was made of a material called bentonite--used in the drilling of wells--and has the consistency of chocolate syrup. Sounds fun to wallow in, huh? ;) That scene alone took a solid week to shoot. No wonder. Did you know that John Wayne insisted that the role of the puny Governor be called "Cuthbert H. Humphery", with the intention that he be seen as a parody of liberal Senator Hubert H. Humphrey--whom John Wayne strongly disliked? The inspiration for the movie McLintock! was none other than William Shakespeare's "Taming of the Shrew". Did you know that? I didn't! 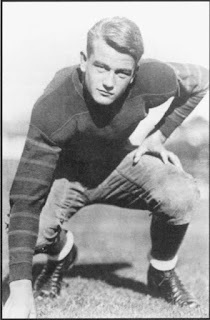 Did you know that John Wayne's grandfather was a Civil War Vet? Or that it was a local fireman on his route to school that started calling Wayne "Little Duke" because he never went anywhere without his Airedale Terrier dog named Duke? That suited Marion Robert Morrison (his given name) just fine. Duke sounded better than Marion, so he kept it. But he dropped the "little" part, of course. Who wouldn't at a towering 6'2? Did you know that Wayne played football in high school--Glendale High, to be exact? Or that he played on the USC football team under the legendary Howard Jones? He even applied to the U.S. Naval Academy but was not accepted. When he was injured (from wake boarding of all things) and lost his athletic scholarship, he started working in the prop department of a movie set. Did you know that it was rumored Wayne met the legendary gunfighter and lawman Wyatt Earp? Or that John Wayne was very patriotic--going so far as to turn down roles that he deemed un-American? Did you know that while making "The Green Berets" (a movie made to support the Vietnam War), the Montagnard people of Vietnam's Central Highlands--passionate fighters against communism--gifted Wayne with a brass bracelet that he wore in the film? Did you know that in his last movie, The Shootist, his character died of cancer--the same disease that would kill him? 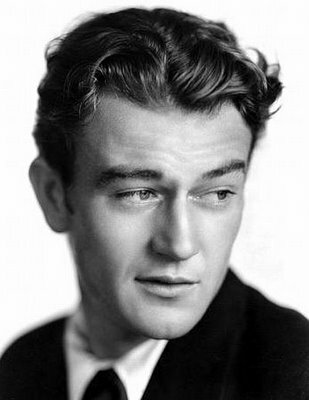 Did you know tha t Joseph Stalin ordered for John Wayne to be assassinated even though he was a fan of his movies? Apparently Stalin was none too pleased with the Duke's strong anti-communism movies and political statements. Stalin died before the assassination could be completed. But no matter what, I think John Wayne made this country and this world a little better just by being the Duke. I know it sounds silly. But it is true. There are just some people in our history that are irreplaceable. Even if they are movie stars. They inspire, shape and mold, captivate and encourage generations that outlive them. The Duke's footprints will never be washed away. Not at Grauman's Chinese Theater...and not in the hearts of those yet to fall in love with his films. Don't believe me? Listen to this speech John Wayne made when he won an Oscar for True Grit. You won't regret it.